There have so many incredible moments over the last 5 years! We’ve seen how Gig Buddies’ independence grows by being part of the project and heard stories of the project inspiring people across the world. Although, our hope is to one day not exist because adults with learning disabilities will, finally, be able to have the same access to and choice over their social lives as the rest of society. We will keep on running the project (and partying) until that day! The infographic below is by no means the only things we are proud but here are our top 5 achievements to celebrate 5 years of the project. 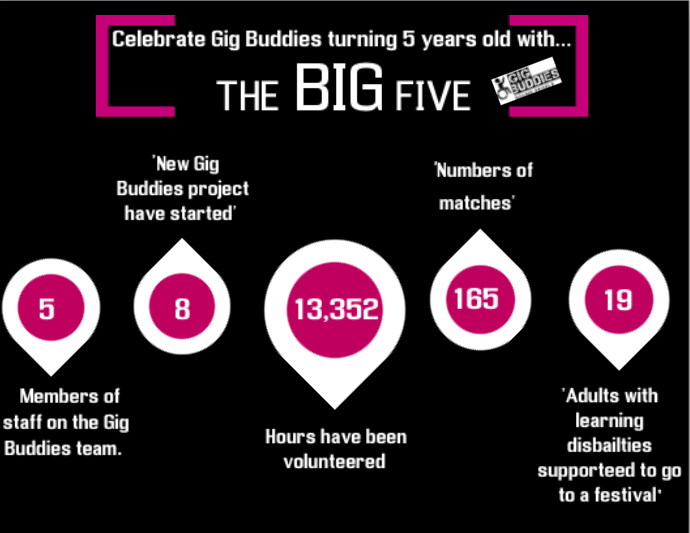 So from all of us at Gig Buddies HQ we would like to say a BIG thank you to everyone who has supported the project throughout the last 5 years. We’ve danced our way through muddy fields all the way to the streets of Brighton during Pride and its all been possible because of you! We cant wait to see what will happen over the next 5 years! *Why not tell us your biggest Gig buddies achievements over the last 5 years in the comments? !